Story: Expendable: capable of being sacrificed in order to accomplish a military objective. Barney Ross (Sylvester Stallone) is a man with nothing to lose. Fearless and void of emotion, he is the leader, the sage and the strategist of this tight-knit band of men who live on the fringe. His only attachment is to his pickup truck, his seaplane and his team of loyal modern-day warriors. His is a true cynic who describes what he does as removing those hard to get at stains. 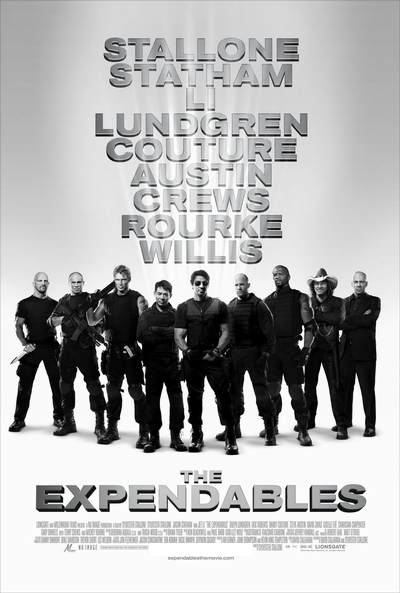 The team behind him is made up of Lee Christmas (Jason Statham), former SAS and a savant with anything that has a blade; Yin Yang (Jet Li), a master at close-quarter combat; Hale Caesar (Terry Crews), who has known Barney for ten years and is a long-barrel weapons specialist; Toll Road (Randy Couture), a skilled demolitions expert and considered the intellect of the group; and Gunnar Jensen (Dolph Lundgren), a combat veteran and an expert in precision sniping who struggles with his own demons.